Our most economical and safest real baseball pitching machine, the Heater BaseHit delivers the perfect pitch with every throw. It is amazingly accurate, delivering baseballs, plastic practice balls or lite-balls right on target. An adjustable knob allows you to alter the height of the pitching machine so that you can work on your challenge areas. The BaseHit pitching machine's horsepower variable speed motor hurls from 15 to 45 miles per hour, making it a machine that will grow as your skills develop. Because it comes with an automatic feeder, you can hit a ball every 10 seconds without needing another person to feed balls into the machine, too! 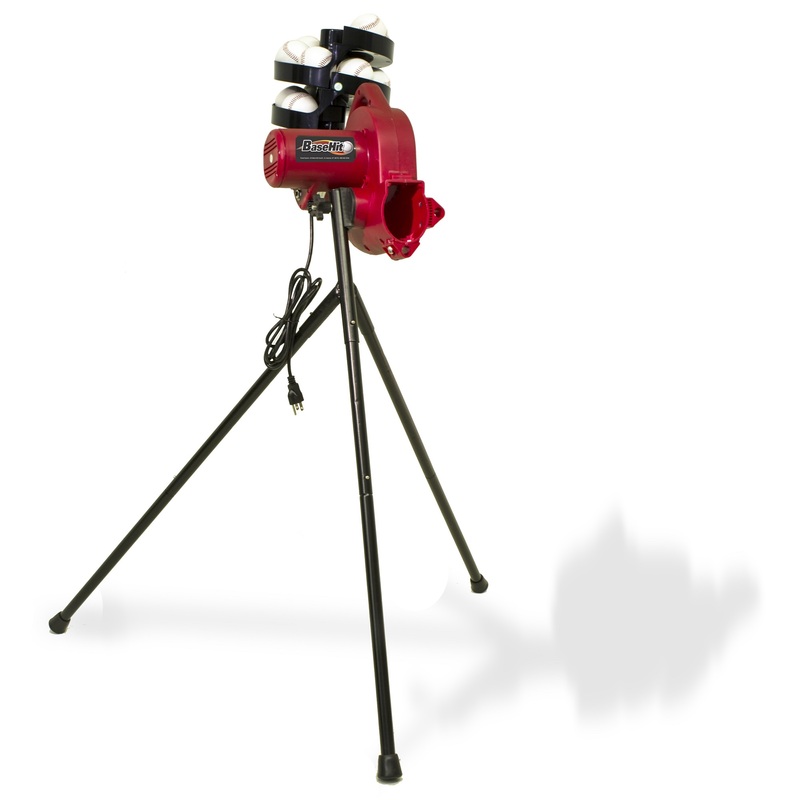 The Heater BaseHit Pitching Machine is supported by three durable tubular steel legs and has a composite housing that completely encloses the motor and wheel for safe and effective operation. The BaseHit pitching machine sets up in seconds and comes with a standard 110 volt AC power adapter. Like all Heater Sports products it features a one year manufacturer's warranty as well as a 30-day money-back guarantee to ensure your total satisfaction. PLEASE NOTE: Although the Heater BaseHit Pitching Machine can technically pitch regulation baseballs, the seams on leather baseballs cause inaccurate throws and are known to wear out pitching machine wheels much quicker than dimpled pitching machine balls do. 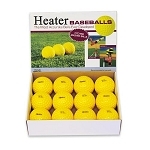 Therefore, it is recommended that you only use approved Heater Pitching Machine balls with it. 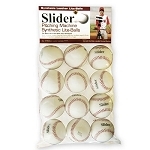 See the Approved Balls tab, above, for a list of balls that can be used with the Heater BaseHit pitching machine. A: No, it runs on 120V electricity from a standard outlet like most other pitching machines on this website. The only pitching machines sold here that operate off of a battery are the two Zooka pitching machines. Q: Can you use wiffle balls in this pitching machine? 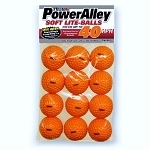 A: It probably would depend on the brand of wiffle ball and how hard it is. The gap between the wheel and the stop plate is about 1/4 inch less than the diameter of a ball, so that ball gets squeezed before it is shot out the other side. Add to that the fact that most wiffle balls have holes in them that restrict their flight, and you'd certainly never get a pitching machine to throw a wiffle ball 60 feet to a batter. You'd have to move the machine much closer to get the ball to cross the plate. This machine can throw the Heater lite balls and soft lite balls; though, I'd stick with them! To ensure your satisfaction, the Heater BaseHit Pitching Machine includes a 30 Day Money Back Guarantee. BaseHit pitching machines are also backed by a Full 1 Year Warranty that includes repair, replacement and labor. No matter where you order a BaseHit Pitching Machine from, NOBODY actually stocks them; they all ship directly from the manufacturer's warehouse located in St. George, Utah. Therefore, the shipping time frame is exactly the same no matter what website you order from (we hope that it is this one!). Heater BaseHit Pitching Machines typically take 2-4 business days to ship from the time you place your order. They ship via Federal Express (FedEx) Ground and could take anywhere from a day or two to a week to get to you AFTER being shipped, depending on your proximity to their warehouse. We will notify you of your tracking number the moment we receive it from the manufacturer's warehouse. Click here to download an easy to read, printable PDF of the Heater BaseHit Baseball Pitching Machine Owner's Manual.